Part One of the Opening Day roster surprises can be found here. Alfredo Simon is in the rotation after having a fantastic spring training. George Kottaras chosen over Josh Bard to back up Jason Varitek. Chris Carter is the extra corner outfielder rather than Brad Wilkerson. Rookie Ramiro Pena beat out Angel Berroa for the extra infielder job. 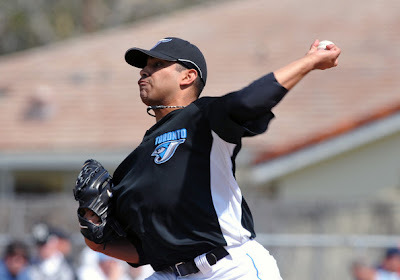 Jonathan Albaladejo is chosen over several more experienced veterans for the last bullpen spot. Jeff Niemann makes the rotation after all, thanks to the last minute trade of Jason Hammel to the Colorado Rockies and the demotion of David Price to the minors. Rookie Ricky Romero and Scott Richmond are the numbers four and five starters. DeWayne Wise and Chris Getz have not only won the starting center field and second baseman jobs, but are also batting first and second in the lineup. A lot of weight put on two relatively inexperienced players on a team expected to win. That the Indians would rather play three players at their second best position rather than two at their best position and one at the position he is best suited for -- Mark DeRosa 2B, Asdrubal Cabrera SS, and Jhonny Peralta 3B -- and sticking with DeRosa at 3B, Peralta at SS, and Asdrubal at 2B. The release of Gary Sheffield was mildly surprising but rookies Rick Porcello in the rotation and Ryan Perry in the bullpen have to be the greater qualifiers. Mark Teahen looks like the starting second baseman -- his third position change as a Royal. Manager Ron Gardenhire did not find a way to squeeze Michael Cuddyear into his starting lineup. But you have to like the potential of a Carlos Gomez, Denard Span, Delmon Young outfield. Left-hander Brian Duensing in the bullpen rather than Jose Mijares. If we ignore all the pitchers in the rotation because of injured veterans, the demotion of shortstop/third baseman Brandon Wood who probably deserved a chance in the majors. Billy beane acquiring three major league veterans (Matt Holiday, Orlando Cabrera, and Jason Giambi) was pretty surprising, but not as much as throwing top prospects Trevor Cahill and Brett Anderson directly into the rotation. Shawn Kelley made the team and will pitch middle relief. Kris Benson has returned to the major leagues and is in the Rangers rotation.